COMPLETELY RENOVATED FROM TOP TO BOTTOM IN 2015. ********PLEASE CHECK CALENDAR, ABOVE, FOR AVAILABILITY. ************ IT IS UPDATED DAILY AND ACCURATE!!!!! 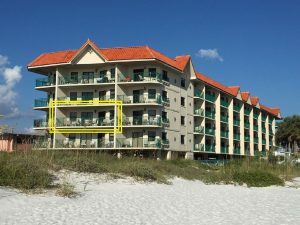 BUILDING IS RIGHT ON THE BEACH….TRUE GULF FRONT UNIT. 4000 GULF BLVD. 3RD FLOOR UNIT. ELEVATOR ON SITE. VISTAS ON THE GULF. ONE OF THE FEW UNITS WITH A KING SIZE BED IN MASTER AND A FULL SIZE BED IN 2ND ROOM………PLEASE VIEW ALL PHOTOS TO SEE WHAT UNIT OFFERS AND TO SEE VIEWS FROM THE UNIT….COVERED PARKING INCLUDED!